Chandragupta Maurya was the founder of the Maurya dynasty which ruled the ancient kingdom of Magadha from around 321 BC to 185 BC. Chandragupta Maurya can also be said to be the foremost of the ancient Indian rulers who ruled over the maximum amount of known territory in Bharatvarsha (India). His territories extended from present day Afghanistan-Pakistan to the southern Indian state of Karnataka and right up to the east as far as Bengal and Assam. 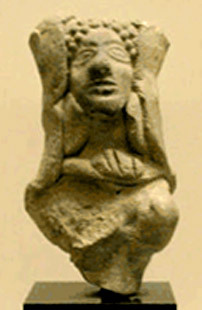 He was succeeded by his son Bindusara (in about 297 BC). Then there is this version that Chandragupta was the son of the last king of the Sisunaka dynasty, Mahanandin, and Mura, and whose second wife Sunanda was the mother of the Nanda brothers. Apparently, with the help of a barber named Mahapadmananda, this second wife, Sunanda, murdered her husband and Chandragupta's brothers and installed Mahapadmananda as the king. Mura escaped with her young son, who grew up and swore revenge. Yet another source calls Chandragupta's father a commander to Mahapadmananda's forces, whom Mahapadmananda had murdered by deceit. However, the most popular version is that Chandragupta belonged to a 'kshatriya' (warrior) clan called 'Moriya' which originally ruled 'Pipallivana' (Uttar Pradesh), a forest kingdom. After her husband's death, Chandragupta's mother shifted to Patliputra where she gave birth to her son. Whatever the truth, until unbiased and conclusive proof is unearthed, the authenticity of these texts will remain uncertain. Chandragupta was noticed by a Brahmin teacher (Acharya) of the Taxilla (Takshashila) university, named Acharya Chanakya Vishnugupta (and also known as Kautilya), the son of the famed scholar, Chanak, and a pundit in his own right. To Vishnugupta, he seemed precocious as a child, displaying leadership qualities when with his friends that impressed the Taxillan teacher. Vishnugupta took the young Chandragupta under his tutelage where his formative years took shape. Chandragupta was trained in political science, economics, philosophy, sword fighting, wrestling, archery and other martial arts. Vishnugupta thus proved to be Chandragupta Maurya's mentor, philosopher and guide. Vishnugupta, known for his legendary acumen in political science, can also be attributed to Chandragupta's ascension to power and its long and subsequent retention (Vishnugupta was later to serve as Chandragupta's advisor and as a minister in his court). Another source tells us that Chanakya was a member of Dhanananda's court and that Chandragupta served in his army. Apparently after a falling out with the arrogant king on different occasions, both were expelled from his service, and they later colluded to overthrow Dhanananda. There is a story in which Chanakya, while moving through the forests with Chandragupta, was pricked by the thorn of a jungle weed. Chanakya proceeded to pour sugar syrup all over the weed. When Chandragupta asked the reason, he was told that the syrup will attract the ants, which in turn will destroy the thorny weed from its roots and clear the path for future travellers. Impressed by Chanakya's wisdom, Chandragupta became his disciple. Whatever the truth might be, it is evident that with time and evidence that has been lost, the line between fact and fiction has become blurred. 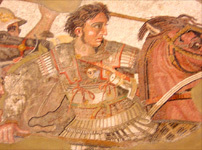 In 327 BC, Alexander, the Macedonian king, along with his Greek, Macedonian and subject Central Asian armies invaded India. His entry was facilitated by King Ambhi of Taxila, ostensibly to use these Greek armies against his arch rival, King Porus (also known as Puru or Parvataka through other sources) of Taxila. Soon the Greeks marched over almost the entire upper half of India (except Magadha, which as per the Roman Greek historian, Plutarch, was too powerful for Alexander to take on), thus making the various smaller kingdoms his vassals (unless he ravaged them). Apparently, Acharya Vishnugupta had approached the Nanda king, Dhanananda (Nandrum), for his help in raising an united army to fight against the Greeks. But stories say he was humiliated and turned away by an inebriated Nanda. This insult strengthened Vishnugupta's resolve to do away with the Nanda dynasty. He, along with his pupil , Chandragupta, raised an army of teachers, students, monks, rebels, mercenaries, and tribals (Chandragupta was also said to be aided by a Kekaya king known as Parvataka who is usually equated with Porus of Paurava). Alexander meanwhile had departed and had placed his general, Seleucus Nicator, as the chief satrap of the Indian subcontinent. A power vacuum was created by Alexander's departure. 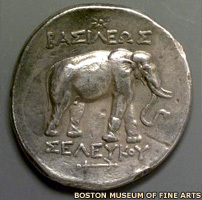 Seleucus had based himself in Central Asia (in Bactria), with Philippus as the satrap of the upper Indus valley. Chandragupta initially started on his path in the lower Indus valley, which he liberated. He then assisted revolts from several Indian satraps which also led to the assassination of Phillipus in 325 BC. Soon northern India was under Chandragupta's control. Chandragupta's victorious armies then started eating into Magadha's surrounding territories, until they finally conquered the powerful Magadha kingdom itself (after an internal conflict which was apparently orchestrated by Vishnugupta). The decadent Nanda king, Dhanananda, was either killed or exiled, as per various sources. The Nanda empire collapsed in spite of the Nandas apparently having wise ministers like Varuchi, Katyayana, Shaktaar, and a corrupt commander of forces called Bhadrabahu. 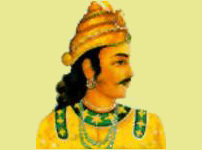 In 321 BC , Chandragupta Maurya was crowned king of Magadha. He immediately declared his mentor, Vishnugupta, to be his prime minister. Vishnugupta, however, retained the Nanda's loyal minister, Katyayana Rakshas, in his original post (after much persuasion) and took on the role of an elder statesman and advisor. 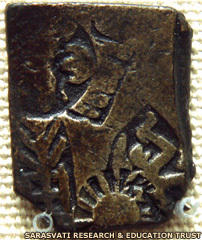 Chandragupta then embarked on his conquest of the rest of India, starting from central India. He overcame all opposition in the territory up to the north of the River Narmada. As per the version of the history by Plutarch, his armies numbered around 4,00,000 troops (Pliny, the Roman naval commander and author of 'Naturalis Historia', has Chandragupta with infantry numbering 6,00,000, along with 30,000 cavalry and 9,000 war elephants). In 305 BC, Seleucus Nicator himself led his Greek armies to conquer his lost territories. But this time around, Chandragupta proved more than a match for him. Seleucus was forced to enter into a treaty with Chandragupta, whereby he surrendered his territories of Arachosia (Kandahar), Gedrosia (Baluchistan), Paropamisadae (Kamboja), Aria (Herat), and Kabura (Kabul). He even entered into a matrimonial alliance with Chandragupta, where in one of Seleucus' daughters was betrothed to the Indian king. In return Chandragupta assured him his support in consolidating Central Asia, along with a gift of 500 war-trained elephants. Subsequent relations between the Greeks and the Mauryans appear to be cordial. Seleucus even appointed Megasthenes as his ambassador to Chandragupta's court. Megasthenes later penned the famous travelogue, 'Indica', recounting his travels and his stay in India. Chandragupta has been identified by the name 'Sandrokottos' in the contemporary Greek texts. Chandragupta was known to be a benevolent ruler, one who not only extended the peripheries of his empire but also ruled it with considerable prudence, under the able guidance of his aide, Vishnugupta, for almost a quarter of a century. Trade, agriculture and commerce were based on some of the principles and rules which were enunciated by Vishnugupta, and the country prospered during the Mauryan rule. During his lifetime, Vishnugupta authored the famed treatise, 'Arthashastra', and also 'Nitishastra' under the pseudonym of Kautilya. It essays the tenets of ruling a country and concentrates (besides the politics), on its military, security, economic, social and moral facets. The council of ministers consisted of three to twelve members, each being the head of a department. Then there was the state council which could have twelve, sixteen or twenty members. Besides, there was the bureaucracy consisting of the 'Sannidhata' (head of the treasury), 'Samaharta' (chief revenue collector), 'Purohita' (head priest), 'Senapati' (commander of the army), 'Pratihara' (chief of the palace guard), 'Antarvamisika' (head of the harem guards), 'Durgapala' (governor of the fort), 'Antahala' (governor of the frontier), 'Pair' (governor of the capital), 'Nyayadhisha' (chief justice), and 'Prasasta' (police chief). Then there were the 'Tirthas' and 'Amatyas', ie. officers in charge of accounts (controlled by the chief minister, 'Mahaamatya') of the treasury, records, mines, mints, commerce, excise, agriculture, tolls, public utilities, armoury, etc. The governors or viceroys of provinces were called 'Mahamatras' and if the designation was held by a prince then he was called 'Kumara mahamatra'. Assisting them were the 'Yutas' (tax collectors), 'Rajukas' (revenue collectors), and 'Sthanikas' and'Gopas' (district officers). Then there was the local village head called 'Gramika' under whom the village assembly operated. The civil courts were called 'Dharmasthiya' and criminal courts were called 'Kantakshodhana'. Arthashastra stresses an efficient espionage system. Spies operated not only in the city but outside, in foreign regions, as well. The defence forces consisted of the navy, infantry, cavalry, war chariots and the war elephants. There were hospitals not just for people but for animals as well. There were census records maintained on births and deaths. There were wells, gardens, tanks, amusement places, and temples erected in various parts of the city. The royal share of the produce of the land was called the 'Bhaga' and was generally one-sixth (16.6%) of the total. The shepherds and livestock breeders were taxed. Also, there was the forest tax, a tax on intoxicants, a mine tax, a fishery tax, an irrigation tax, etc. Seaborne trade was controlled by the state. The state also owned factories producing cloth, etc. Kautilya has stated that collection of tax should be akin to a bee collecting honey from the flower, just taking the minimum that is required, negating the chances of tax evasion. 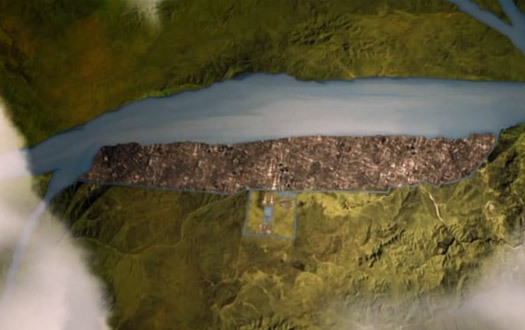 Every city was divided into wards and further groups of houses. The roads measured 1,150 miles in total (1,851 kilometres) and were quite wide according to the accounts by Megasthenes. There were trees planted on both sides of the road. Arthashastra also enunciated the ideal relations between a father and son, brother and sister, husband and wife, teacher and student, etc. 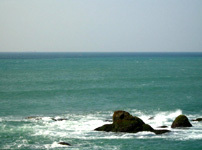 There is a section which deals in inter-state relations. They were to be based on the four traditional expedients: 'Saama' (conciliation, alliance), 'Daama' (gifts, subsidies), 'Bheda' (sowing dissension in hostile states), and 'Danda' (aggressive action). Citizens need to follow their duties diligently in order to ensure the welfare of the state. The king and his subjects should exercise control over their instincts and desires. One may indulge in cardinal pleasures, but in limitation. Only cowards are afraid of defeat and one shouldn't hesitate in attempting a mission (one shouldn't shun karma). A king should be religious in nature, respectful towards his elders, teachers and courtiers. He should refrain from tyranny. He should follow a pragmatic, prudent and conciliatory approach towards issues. To achieve social goals , one has to forego personal interests. Politics shouldn't be self-serving but should be for the welfare of the state. An egalitarian society is one in which there are equal opportunities for all. According to Kautilya, there should be an efficient management of resources. It is essential that the state keeps an eye on the occupation of excess land by landlords and the unauthorised use of land. Ideally the state should monitor the most important and vital resource - land. The state should always take care of agriculture. Government machinery should be directed towards the implementation of projects aimed at supporting and nurturing the various processes, beginning from the sowing of seeds to the cutting and supply of the harvest. The nation should embark on constructing forts and cities. These complexes would protect the country from invasions and provide internal security. The cities would serve as giant markets, increasing the revenue of the state. Internal trade was more important to Kautilya than external trade. At each point of the entry of goods, there was to be a minimal amount of tax collected. A country should have a self-sufficient economy and shouldn't depend completely on foreign trade. The laws of the state should be the same for all, irrespective of a person's position in society. The security of citizens in peace time is paramount, because the state is the saviour of its subjects. Criminals and antisocial elements should be kept under check with the help of spies. Destitute women should be protected by society from exploitation. Kautilya has suggested a society in which the people are not slaves of material pleasures. Control over one's sense organs is essential for success in any endeavour. Spiritual development is essential for the internal strength and character of the individual. Material pleasures and achievements are always secondary to the spiritual development of the society and country at large. The task of a king is to strive for the welfare of his people day in and day out. The administration of the kingdom should be foremost for the king. The happiness of his subjects is the happiness of the king. Their welfare should be his welfare. New colonies should be established for the augmentation of resources. Also advocated is the development of already annexed colonies. Vishnugupta Chanakya is often termed India's Machiavelli. He trained Chandragupta into the valiant warrior that he was, and acted as his trusted eyes and ears, warding off the nefarious designs of his enemies. It can also be said that Chandragupta Maurya could embark on his long war campaigns knowing full well that the administration of his kingdom was safe in the hands of his elderly and competent statesman, Chanakya Vishnugupta. Vishnugupta remained the advisor for Magadha even after Chandragupta's reign, assisting his son, Bindusara. There is a story that Vishnugupta had been feeding Chandragupta small quantities of poison with a glass of milk since childhood in order to make him immune to poison. He continued that practice after Chandragupta became king. One day, Chandragupta's wife, who was nine month pregnant and was unaware of the poisoned glass of milk, drank it. Frothing at the mouth, she collapsed and died. On hearing the news, Vishnugupta immediately went to her and ordered her womb to be torn open. Thus the unborn baby was extracted and the child was named Bindusara (Bindu literally meaning 'a drop', in this case a drop of poison). Bindusara also had a minister named Subandhu who disliked Vishnugupta immensely. He poisoned Bindusara's mind against Vishnugupta, implying that Vishnugupta Chanakya was responsible for the murder of his mother. On hearing this, Bindusara became very angry with Chanakya. It is said that Chanakya, on hearing that the king was angry with him, donated all his wealth to the poor, widows and orphans and sat meditating on a dung heap, preparing to die by total abstinence from food and drink. Bindusara meanwhile heard the full story of the circumstances of his birth from the nurses who'd cared for him, and rushed to beg forgiveness from Chanakya. But Chanakya refused to relent. Bindusara then went back to Subandhu and vented his fury on him. Subhandhu implored the king for time so as to beg for forgiveness from Chanakya. But Subandhu had other plans. He wanted once and for all to end his arch rival's influence. So he arranged for a ceremony of respect but, unnoticed by anyone, he slipped a smouldering charcoal ember inside the dung heap. The dung heap caught fire, and Acharya Chanakya Vishnugupta, the man behind the Mauryan empire was burnt to ashes. 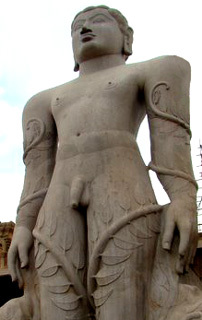 Chandragupta embraced Jainism during his lifetime. Later, he is said to have abdicated his throne in favour of Bindusara. Chandragupta then retired to the forests of Shravana Belgola (near Mysore city, in Karnataka state), along with his religious guru, Bhadrabahu, and several followers, where he renounced his life after a fast unto death as per Jain traditions. Bindusara succeeded his father in 301 BC (or, alternatively, 297 BC). He was also known as Amitraghata (slayer of the foes) or Amitrochates to the Greeks. He was said to be a competent ruler who successfully consolidated the vast empire that he had inherited. 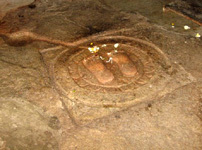 He is said to have maintained friendly relations with the southern kingdoms of the Cholas, Pandyas and Cheras. The only exception was the hostile kingdom of Kalinga, which was only overcome later, by his son Ashoka. Tibetan history attributes to him the conquest of the land between the Arabian Sea and the Bay of Bengal. But there is no conclusive proof to establish that as fact. He is said to have been be a man of eclectic tastes, and to have asked the Greek Seleucid king, Antiochus I, to send him some sweet wine, dried figs and a sophist (a Greek teacher of philosophy and rhetoric). The Greek ambassador present in his court at the time was Deimakos. Buddhist texts reveal that he was deeply interested in the Ajivika sect (the Ajivikas were a sect of wandering ascetics who believed that rebirth was not according to one's karma (deeds), but a matter of 'niyati', meaning destiny or fate). Bindusara had many sons, but the most prominent amongst them were Sushima, the governor of Taxilla, and Ashoka, the governor of Ujjain. 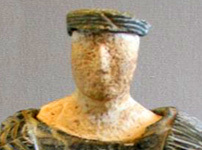 The latter succeeded him twenty-five years after he ascended the throne, in c.272 BC (or 269 BC). Bindusara's death caused a brief power struggle between Ashoka and Shisiuma and the other brothers, but it was Ashoka who gained the throne. Text copyright © Abhijit Rajadhyaksha. An original feature for the History Files.